Developers of deep learning frameworks can rely on NCCL’s highly optimized, MPI compatible and topology aware routines, to take full advantage of all available GPUs within and across multiple nodes. 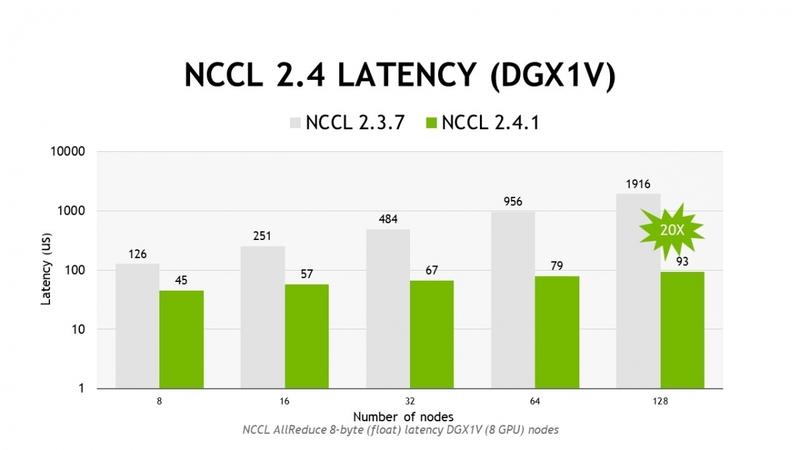 Leading deep learning frameworks such as Caffe,Caffe2, Chainer, MxNet, TensorFlow, and PyTorch have integrated NCCL to accelerate deep learning training on multi-GPU systems. We strive to bring the best experiences to the developer community, as a result we have made NCCL 2.3 and later open source. This enables us to have open discussions with the developer community as we continue to build a great product. The source code for NCCL is available on GitHub and NCCL binaries can be downloaded from NVIDIA Developer Zone. Read the latest NCCL release notes for a detailed list of new features and enhancements. Faster training of newer and deeper models with aggregated inter-GPU reduction operations. Multiple ring formations for high bus utilization. Tree algorithm implementation for large scale multi-GPU and multi-node training reducing latency.